Britain’s most prominent free-market think tank is offering to broker access to senior politicians for foreign donors seeking to influence the course of Brexit, an undercover Unearthed investigation has found. The head of the Institute of Economic Affairs (IEA) boasted about setting up meetings with Brexiteer MPs, a government minister and senior trade officials for US visitors who had agreed to raise money for the IEA’s work pushing for a US-UK free trade deal. The visitors, who met politicians including the then Brexit minister Steve Baker in May, came from an Oklahoma think tank which has promised to raise donations for the IEA, including from American farming interests who are keen to ensure the UK drops EU-level regulations after Brexit. US officials have said they will insist that any US-UK free trade deal allows controversial US agricultural products such as chlorine-washed chicken and hormone-injected beef to be sold in UK supermarkets. IEA director general Mark Littlewood also told an undercover reporter, posing as a representative of a US agribusiness investor, that becoming a donor would allow his client to attend “intimate” private dinners and lunches, at which attendees “get to know cabinet ministers on first name terms”. Trickett has now written to the Charity Commission claiming the IEA may have breached charity law by acting politically and calling for an inquiry. An undercover reporter was offered the possibility of attending a private dinner with environment secretary Michael Gove, if they funded a £42,500 IEA report on innovation in agriculture after Brexit. The IEA has set up a secretive funding channel for money from Oklahoma to fund its controversial trade team, including from agribusiness interests. The IEA is quietly soliciting funding for its reports from donors who also have vested commercial interests in the subject matter, and confirmed it would approach alcohol companies to fund work on drink pricing. A former Charity Commission board member says the investigation suggests the IEA is “masquerading as an educational venture” and potentially breaking charity rules. The IEA has been criticised for refusing to disclose its donors. Monitoring organisation Transparify describes its funding as “highly opaque”. However, it is a high-profile voice in the UK media: Littlewood told Unearthed’s undercover reporter that while the IEA’s turnover is £2.5m, it punches above its weight in terms of prominence through “a pretty substantial media effort”. 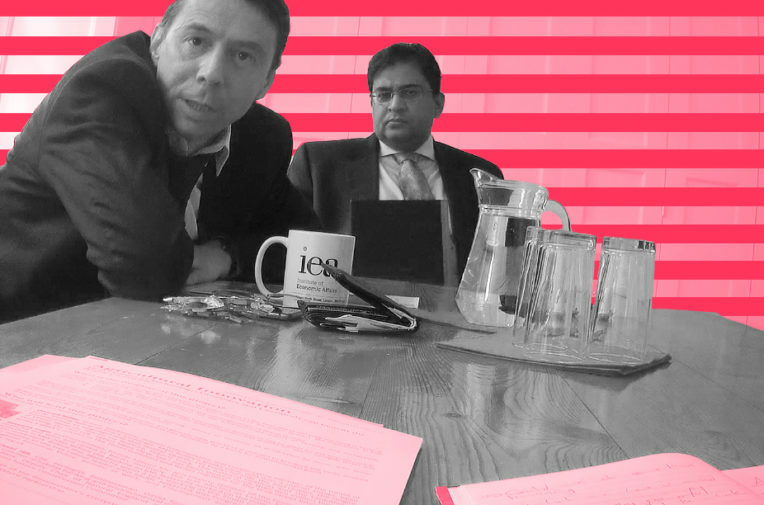 Although it took no official position on the EU referendum, the IEA has moved to the forefront of the push for a hard Brexit, hiring controversial trade adviser Shanker Singham in March. This month, supporters of a deregulatory Brexit had a setback when the prime minister unveiled proposals at Chequers that ruled out any reduction in agricultural standards after Brexit. But the Chequers deal has met furious resistance and resignations, including the departure of three Brexiteer ministers – Boris Johnson, David Davis and his deputy Steve Baker. It also prompted a parliamentary backlash from the European Research Group (ERG), the powerful hard-Brexit faction led by Jacob Rees-Mogg. Singham, who is in close contact with the ERG, praised Davis’ resignation in an article in the Telegraph. Littlewood told an undercover reporter that Singham was “unbelievably well connected” to Brexiteer cabinet ministers including trade secretary Liam Fox, Michael Gove and former foreign secretary Boris Johnson and would be able to introduce the ministers to the prospective US agribusiness donor. The Institute of Economic Affairs is one of the UK’s oldest and most high-profile free market think tanks. Established in 1955 by Antony Fisher, who made his fortune importing battery farming to the UK, it champions shrinking the state and reducing regulations, arguing against regulation of tax havens and fast food, and for privatisation of childcare and the NHS, as well as becoming key proponents of a hard Brexit in which the UK drops EU-style regulations. Its director-general, Mark Littlewood, is ranked as one of the UK’s most influential conservative figures, and the IEA estimates its spokespeople appear in the UK media five times a day on average. Singham was “writing Gove and Johnson’s script” on leaving the customs union, Littlewood claimed. He also confirmed a Mail on Sunday report from last November that Singham drafted a letter from the pair to the prime minister insisting she stick to a hard-Brexit course. At the time, Gove claimed not to remember whether Singham had written the letter. Littlewood said Singham and his team speak with Gove “every three or four days, along with David Davis, Boris Johnson, Liam Fox”. Singham’s contact with Steve Baker, the former DExEU minister, has come under particular scrutiny after BuzzFeed reported Baker had failed to declare frequent meetings with the adviser. Baker told BuzzFeed they had not discussed government business so there was no requirement to register the meetings. Littlewood told the undercover Unearthed reporter he had been used as a “slight shill” to hide some of Singham’s meetings with Baker, attending meetings alongside Singham so the minister could officially record visits as “Mark Littlewood and staff”. A spokeswoman for the IEA said of Littlewood’s comments on hiding meetings with Baker: “We do not recognise this version of events”, adding that ministers should register meetings they attend transparently. The IEA’s spokeswoman said the charity takes “no corporate view” on Brexit. A spokesman for Gove told Unearthed: “Food safety and animal welfare standards will not be weakened after Brexit. Earlier this year, Littlewood set off on what he described as a “lucrative” tour of the US, aiming to raise funds for Singham’s trade team. At a February meeting in Florida, Littlewood made a “plea” for donations to the IEA’s new trade unit, explaining it would “have as its top priority pushing for US-UK free trade.” The following month, Singham moved with three of his staff from the Legatum Institute, another think tank, to the IEA. Separately she said that Littlewood had solicited donations to support the US-UK trade deal but added these came from individuals rather than businesses. On the trip, Littlewood also formed a partnership with an Oklahoma-based think tank, the E Foundation, which includes a plan to channel cash from US farming donors to support Singham’s work. The CEO of the E Foundation, Michael Carnuccio, told an undercover reporter that funding Singham’s work offered foreign donors a way to influence Brexit. Singham’s access and influence was part of his appeal to potential US donors to the IEA, he added. In May, Singham arranged for Carnuccio and an Oklahoma beef and petrochemicals tycoon named Tucker Link to meet then Brexit minister Steve Baker at the IEA’s offices. The visitors also met Jacob Rees-Mogg at a meeting in parliament of the ERG, and senior officials at the Foreign Office and the Department for International Trade. Discussing the trip with the undercover reporter, Littlewood confirmed Carnuccio was raising money for the IEA. “We haven’t seen a cent of it yet – we quite often… we speculate to accumulate,” he said. “So with Oklahoma and [Carnuccio] and Tucker coming over we wanted to show what we thought was possible. Singham told the undercover Unearthed reporter that if the supposed US agribusiness funded his work, he would also be happy to “show them round” in the UK. Littlewood also revealed the IEA hosts intimate dinners at its London headquarters at which leading politicians are matched with “five or six donors who have an interest in the area” and “two or three journalists”, although the meals are off the record. Donors can “get to know cabinet ministers on first name terms”, Littlewood said. Littlewood said the IEA is not a lobbying organisation, describing the charity as a “great facilitator” for business to connect with senior politicians. But Littlewood told Unearthed’s undercover reporter that the IEA is happy to solicit research funding from companies with commercial interests in the research subject they are planning to cover. “To give you an example,” he said, “we would take money from alcohol companies – we would go to alcohol companies and say we want to write about the cost of living being too high and actually alcohol consumption is not costing the National Health Service as much money as they often complain”. There are also concerns that the IEA’s push for a Brexit that allows the UK to reduce regulations and sign a sweeping US-UK trade deal amounts to a political campaign. “We’ll either win or lose in 12 months,” he added. In a later meeting, Littlewood revealed the think tank’s work on post-Brexit agriculture is pursuing a specific policy goal: “The key point underlying all of this is that we’ve got to get away from the precautionary principle”, he said, referring to the cautious approach to risk that underpins European environmental regulation. Purkis, the former Charity Commission board member, told Unearthed he had raised concerns with the regulator three times about whether the IEA is breaching charity rules. He said: “Running a campaign for a particular kind of trade deal in a controversial political context… is contrary to all Charity Commission guidance on what an educational charity may or may not do. The IEA were approached for comment on this story, however following publication they released a further statement. Click here to read in full.